Militarily speaking, the Republic of Ireland is officially a ‘non-aligned state’. This means that the country is mostly neutral, but will engage an enemy if necessary or the country is threatened. It is also an active member of the United Nations (UN) and has taken part in some major peacekeeping missions in various countries around the world. 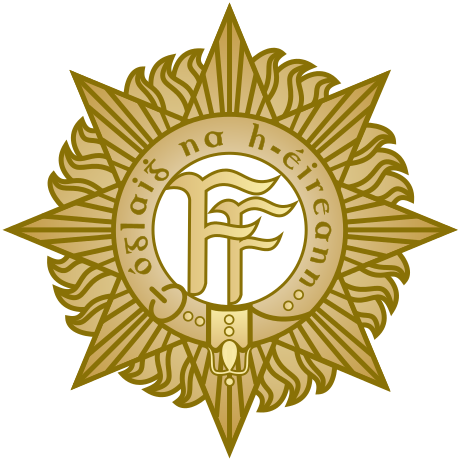 The Badge of the Irish Army (Irish: an tArm). The ‘FF’ in the center stands for ‘Fianna Fail’, meaning ‘Fianna of Inis Fáil’, or ‘Army of Ireland’, representing the mythical pre-Christian warriors of Ireland. This representation of ‘Fianna Fail’ is not to be confused with the Irish political party started in 1926 which took the same name. The words around the outside, ‘Óglaigh na hÉireann’, is the official Irish for ‘Irish Defence Force’ which is also written as ‘Fórsaí Cosanta’. Image: Wikimedia Commons. The 1920s was a dark period in Irish history, marred by both the Irish War of Independence (1919-1921) and the Irish Civil War (1922-1923). The War of Independence was waged between the Irish Republican Army (IRA, Army of the Irish Republic) and Great Britain. The war ended in a ceasefire after a long stalemate. It did, however, result in the Government of Ireland Act 1920, which split the country into two territories. This took place in 1921, and is known as the ‘Partition of Ireland’. It was intended that these territories would be self-governing territories but were still ultimately part of the United Kingdom. In 1922, the country became more drastically divided when the Republic became the Irish Free State, and Northern Ireland committed to remaining part of the United Kingdom. The treaty was disagreed upon by many in the Free State who wanted full independence from the U.K. Ultimately, this resulted in the Irish Civil War, which began in 1922 and was fought between the UK aligned Irish Free State and the Rebel forces of the Republican IRA. Ultimately, the Irish Free State won the war in 1923. However, the Civil War brought about the first use of armored vehicles forces of the Emerald Isle. (This does not include the ‘Guinness Armoured Lorries’ used in the 1916 Easter Rising, which was used by British Aligned Forces). 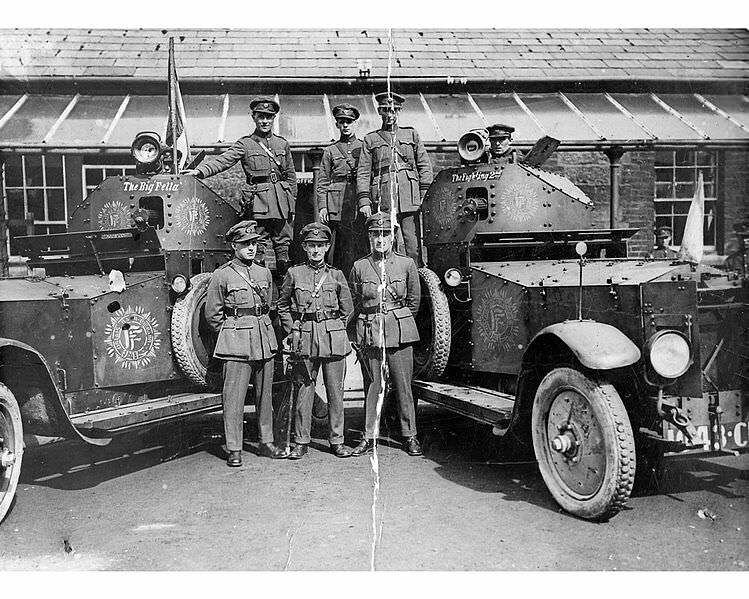 This was in the form of Lancia Armored Cars, built by Great Southern and Western Railway workshops in Dublin in 1921, and was used by the forces of the Irish Free State. In 1937, a new constitution was drafted to replace that of the Irish Free State. Following this, the state would be known as Ireland, or Éire in the Irish language, otherwise known to the world as the Republic of Ireland. On the 1st of September, 1939, Nazi Germany launched their invasion of Poland, kickstarting the Second World War. In Ireland, this became known as “The Emergency” after the state of emergency that was imposed by the Irish Government and which was to last for the duration of the conflict. Officially, Ireland was a neutral party during the War but had slight leanings towards the Allies. However, they did controversially keep prisoners from both sides of the fight in the same camp in K-Lines at Curragh, in Kildare. (Nicholas Moran’s article, ‘Stinky and the Emergency’ explains this further READ HERE). Ireland itself was not untouched by the war however, as both Belfast (the capital of Northern Ireland), and Dublin (the capital of the Republic of Ireland), were bombed by the Germans. 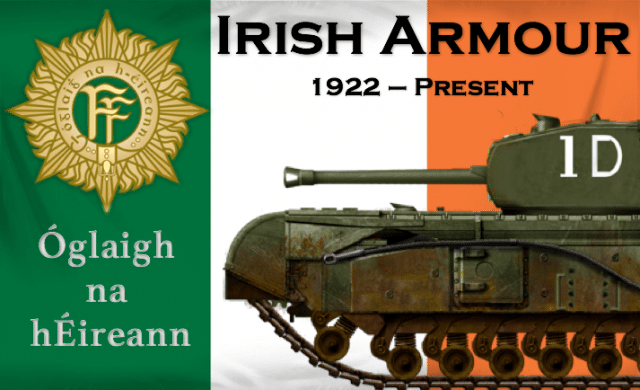 During this time, the Irish Army had a few new armored vehicles to their name. This included 2 Swedish L-60 light tanks produced by Landsverk, a small amount of Rolls-Royce armored cars, and a large number of British Universal Carriers, which were known as ‘Bren Carriers’ in Irish service. Being the most produced armored vehicle in history, it is, perhaps, no surprise that this was the most numerous vehicle in the Irish Army during the period, with 226 in service. Ireland’s neutrality was maintained into the Cold War. It did not join the newly created NATO (North Atlantic Treaty Organization), largely because the North remained part of the United Kingdom. There were plans for the Republic to enter its own alliance with the United States, but this plan did not come to fruition. Ireland did become an active member of the United Nations (UN) and took part in a number of crucial peacekeeping missions. 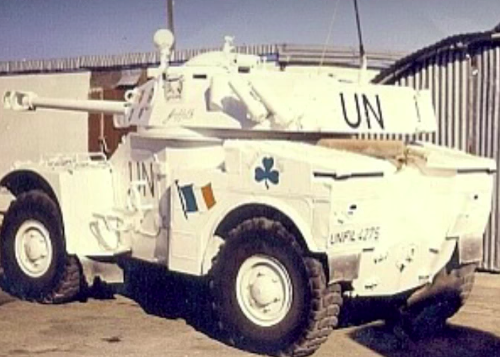 Irish troops under the UN flag fought with distinction in the Congo Crisis of 1960-65 as part of UNOC (United Nations Operations in the Congo). They would also serve in the subsequent missions as part of UNFICYP (United Nations Peacekeeping Force in Cyprus) and UNIFIL (United Nations Interim Force in Lebanon). 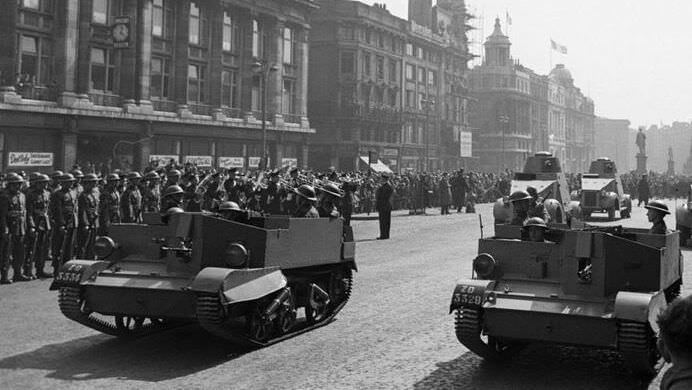 During the early stages of the Cold War, Ireland was still behind the rest of the world when it came to armored vehicles. In the 1950s, they had managed to acquire a small amount of Churchill and Comet tanks from the United Kingdom. They also retained a number of armored cars, such as the Landsverk L180 armored cars, which had been in service since the 1930s and were not stood down until the early 70s. In the later years of the Cold War, they did begin to acquire newer vehicles such as the French Panhard AML, a few of these would serve in the Congo. The Vickers Mk. D, Ireland’s first ever tank. Just one was built by the British company of Vickers Armstrong. It served with the Army up to 1940. FV101 Scorpion CVR(T) (Combat Vehicle Reconnaissance – Tracked), 14 of which were purchased and operated by the IDF from 1980. The Scorpion was the last tracked vehicle to be used by the Irish Army. The Swiss MOWAG Piranha IIIH, 80 of these vehicles are currently in the service of the Irish Army in 6 seperate versions. Entering service with the IDF in the early-2000s, it this most up-to-date and numerous vehicle currently serving. Today, Ireland is still officially a neutral state, but remains an active member of the United Nations. Their military vehicles fit the defensive strategy of the Defence Force which protects Ireland and its constitution. 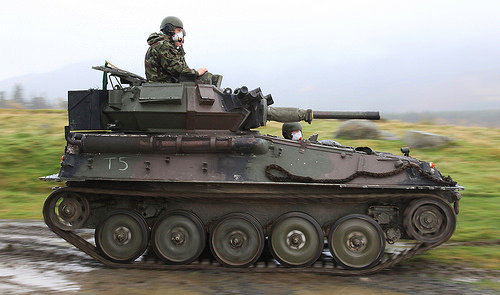 Any form of Main Battle Tank is absent from the Irish Military. The only tracked vehicle in the Irish Military at this time was the FV101 Scorpion CVRTs. Fourteen of these were bought from the United Kingdom and were retired from service in 2017. All armored vehicles in the Irish military now are of the wheeled type. Their front line vehicle is the Mowag Piranha IIIH. Eighty of these 8×8 APCs (Armored Personnel Carriers) were purchased from Switzerland in 2001 and currently remain in service. The most up-to-date vehicle in Irish service is the RG-32 Light Tactical Vehicle. This is a small, armored 4×4 produced by BAE Systems. The first of these was purchased in 2010 and 27 are currently in operation. The Irish Defence Force was founded on the 1st of October 1924. It is divided into three services, the Irish Army (Irish: an tArm), the Irish Air Corps (Irish: An tAerchór) and the Irish Naval Service (Irish: an tSeirbhís Chabhlaigh). Ireland’s armored vehicles serve in the Irish Army with the Cavalry Corps (Irish: An Cór Marcra), often shortened to “The Cav”. The Cavalry Corps started life in 1934 and was born out of the Armored Car Corps which was established in 1922. The Corps was armed with equipment left over from British forces after the War of Independence. This included Peerless Armored Cars. The Cavalry Corps has accompanied the Irish Military around the globe during its peacekeeping missions as part of UN forces. The 1940s era Ford Mk. V/VI armored cars, which were basically civilian trucks with armor and turret bolted on, saw service as part of the UN mission in the Congo Crisis, specifically at the Siege of Jadotville. – 2nd Cavalry Squadron, Cathal Brugha Barracks Barracks, Rathmines, Dublin. 1st and 2nd Squadrons are light cavalry units equipped with Mowag Piranha AFVs and other light armored vehicles. The 1st Armoured Cavalry Squadron was formed in 1998, and was equipped with the Scorpion CVRTs which were used in an armored reconnaissance role. The 1st Armored are an independent entity from the other Squadrons. The traditional headdress of the Cavalry Corps is the Glengarry. Simply, a soft cap with dangling ribbons at the rear, originating from Scotland. The Cavalry Corps’ is a green soft bonnet, with a black band ending in ‘Swallow tail’ ribbons at the rear. The cap was introduced in 1934. It was designed to be more comfortable to wear inside their tanks, rather than their previous hard peak caps. A video by Nicholas Moran talking about Irish military equipment through the years. I,ve been trying to find out how the Irish Rolls-Royces and Universal Carriers were painted during the early Emergency. I’ve seen a B&W picture of a camoflaged Rolls but no idea of the actual color. Any ideas? Thanks. I’m not sure in the case of the Rolls, but the only color picture I have seen of the UC was of it the standard “Irish Grey” color. I’ve just bought a nice replica RR Armoured car (used in movies “Empire of the Sun” and “Michael Collins”). It is a queer shade of garden shed green. I too would love to know. Is it likely they stayed British Army green as they would have been painted when supplied? The ‘colorised’ pathe news reels seem toi indicate so but again its a guess. Hope to get her back to Ireland next summer for a visit. Its hard to say, but I believe they received their grey repaint relatively early into their service. The camo scheme on the armoured car you mention is a two tone light and dark grey. Always interested I Irish Armour. Am a former member of Royal Australian Armoured Corps [RAAC] as a reservist in a Light Horse [LH] Unit. I did 33 yrs.in total in the reserves down here. I am also a scale-model maker and have done a model of the Aer Chor [hope I got that right!]. Am looking to get a few Irish models to make. Regards, Seamus. Are you planning to make articles about the other armored vehicles that were used by the Irish Army during “The Emergency” and after?